Akapusi Qera emerged onto the international scene in November 2005 when he lined up for Fiji against perennial rivals Samoa during the Pacific Nations Cup. The 24 year old openside has a prolific try scoring record for a back row forward and his commitment and aggression have since made him a formidable proposition at both club and international level. Qera is the product of a sporting family, with his father having played international cricket for Fiji and his elder brother having represented the Fijian rugby team. Born in the Fijian capital of Suva, Qera represented the Coastal Stallions in the Colonial Cup before moving to England to play professional rugby for National League One side Pertemps Bees. During his time there Qera was selected for the Fiji Sevens core squad, but was unable to represent them due to his domestic contract commitments. Qera's performances during this period led to his test debut following a year of playing in the Fijian U21 side, and his trademark brand of combative and physical back row play led to him featuring heavily in the Fijian World Cup campaign in 2007. Qera contributed three tries from his four starts during the tournament, including the opener in the outstanding victory over Wales, as the Fijians qualified for the quarter finals. Fiji were one of the surprise packages of the World Cup, and it was thanks in part to the power, pace and flamboyant attacking ability of Qera and fellow back rowers Sisa Koyamaibole and Semisi Naevo. 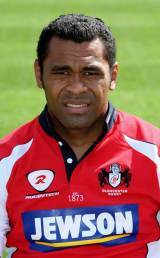 Following the World Cup Qera made the switch to Gloucester, where he had an impressive debut season. In January 2008 he signed a long term contract until 2010 with the club. In May 2008 Qera was nominated for Premiership player of the season, finishing third behind England internationals James Simpson Daniel and Olly Barkley.